A good idea for sure, but one that requires compliance and scaled adoption for it to be meaningful. Several months into the program, that doesn’t appear to be happening. An in-depth analysis of publisher adoption of ads.txt by programmatic data platform Pixalate finds the take rate so far is, well, meh! 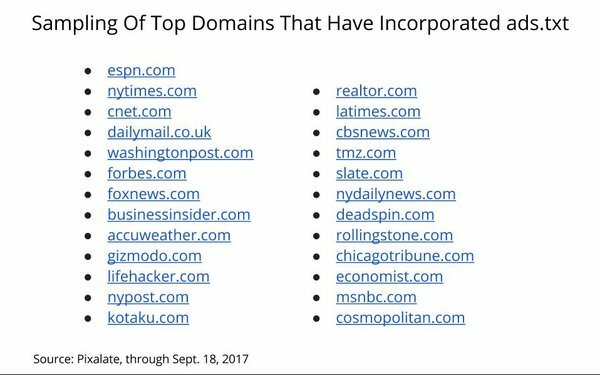 Pixalate examined more than 7 million domains, and found that through Sept. 18, just 3,523 -- or 0.05% -- have incorporated ads.text. On the plus side, Pixalate found higher -- but still relatively small -- levels of penetration among top domains: 3.8% of the top 5,000 Alexa-ranked domains have adopted it. Ranked via Pixalate’s proprietary view of the top 5,000 domains based on volume, adoption is even better: 8.74%. Good thoughts. What do you think? Post comments below, or let me know at joe@mediapost.com, and we’ll follow up on it. 5 comments about "Good Idea, But Ads.txt Isn't Exactly Crushing It -- Yet!". Henry Blaufox from Dragon360, September 25, 2017 at 9:55 a.m. I believe FT.com should be on the list of ads.txt adopters. What about WSJ? It would be a surprise (to me at least) if they haven't gotten around to implementing this. Since it is a way to protect and perhaps enhance the value of assets (ads and ad revnue as a result,) it should be a natural for the major news sites to use this. It is another attribute that would set them apart from sites working more on the margins of the industry. Joe Mandese from MediaPost, September 25, 2017 at 10:20 a.m.
Joe Mandese from MediaPost, September 25, 2017 at 2:38 p.m.
Ben Kneen from Ad Ops Insider, September 27, 2017 at 9:49 a.m. I think this is quite a misleading stat - perhaps there are 7 million websites online, but how many of those sell ads and of those, how many do buyers care about? I would submit there are only thousands in that set - not millions - and it's the adoption among that set that matters. All the tiny ad sense hobbyists out there aren't going to need an ads.txt file. Joe Mandese from MediaPost replied, September 27, 2017 at 9:59 a.m. Which stat? There are several referenced in the story. Pixalate's analysis also shows penetration is much higher among "top" sites. Top, of course is in the eye of the beholder, whether it is Pixalate, Alexa or AdOpsInsider. Ultimately, it is up to users and advertisers to decide what sites are tops with them, and as long-tail principles prove, there's a broad marketplace out there that goes beyond the Fortune 500, or the top 500 publishers. That said, up to readers to decide what is meaningful ads.txt penetration among "top" publishers too. We're just reporting what the study found. Happy to share more info when it becomes available.